To purchase Monoprints contact Carol MacDonald for price and availability. Limited Edition Prints may be purchased here. I am interested in the use of repetition and process in healing and nurturing our spirits in this age of instant technology and the million distractions that become our day, our week, our life. Machines have replaced many of the ways we used to have to slow down and hear our own voice. I notice in my life a yearning for space, both physical and mental and time to breathe, reflect and consider. I find that knitting forces me to slow down and allows me that soulful space. In this work I print from pieces that I have knit. I have learned to draw and paint the process of knitting. By combining the techniques of monoprinting with drawing, the act of knitting becomes a way for me to explore issues of process, repetition, space and time. Printmaking is inherently a repetitious process involving the inking of plates, placing the inked plate on the press bed, placing the paper on the plate, covering with blankets and rolling the bed through the press. With monoprint I build up layers of imagery by printing multiple times on the same paper. I often use the “ghost”, which is the ink left on the plate after printing, to create textures and veils. The transfer of imagery from plate to paper is challenging to control and requires a certain level of letting go for the imagery to emerge. I have chosen to work abstractly, narratively and realistically in this series. The abstract pattern that is created through knit is endlessly fascinating to me. Opening up the stitches to expose the twists and turns the yarn takes as it makes a fabric feels akin to exposing the great secrets of life. Narratively, I often think about life and the unfolding of a day. The quiet dreamy state of waking, the routine of the morning, the complexities that develop through the day, and then winding down into the darkness of night. 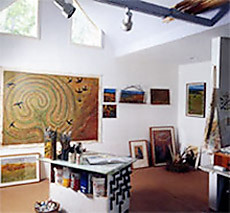 This work often includes visual references to aspects of life and elements from nature. The materials and tools of knitting are beautiful. Colors, dyes, textures of the yarns, the feel of bamboo or wooden needles speak to me. Skeins of yarn have their own rhythms. Balls of yarn become their own planets of overlapping threads. Making drawings of this material honors the process that we have learned. I hear the call to explore our inner riches and make time for ourselves in this distracting, technological world. My intention is that these images evoke the connection to soul that I feel as I make the work. In my work I address issues of human and environmental development, evolution, relationships and healing. In light of the current affairs facing our country and the world, I have recently been working with images that invite introspection, communication, negotiation and cooperation. 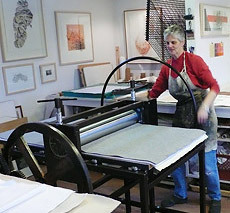 Primarily as a printmaker, I combine monoprint, painting, drawing and mixed media to further the dialogue of community. I think of my work as metaphorically biographical. Taking the issues and concerns that confront me in my personal life as a woman, mother, artists, citizen, and creating images that speak to the universal condition of living in these times. I began working with images of birds in 1999. They developed out of a series of nest images and feathers. Birds live on the earth and in the sky, creating a link to body and spirit. They become a manifestation of our spirit bridging heaven and earth. In their ability to fly and survey the earth, they hold the big picture with changing perspectives as well as the small details of life. Although these birds are not generally meant to be species specific, I often refer to crows and ravens who are very intelligent and playful creatures that work in community and are excellent communicators. As they hold this light side they also have a dark, ominous side as messengers and scavengers. In my work, as in my life, I value the wholeness of holding both the light and the dark.